ADVENTURES INTO DIGITAL COMICS NOW AVAILABLE ON DVD! ADVENTURES INTO DIGITAL COMICS NOW AVAILABLE ON DVD! 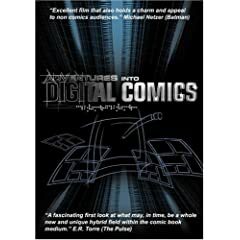 published on July 31, 2008 Read more posts by the author of ADVENTURES INTO DIGITAL COMICS NOW AVAILABLE ON DVD!, Chuck WhelonNo Comments on ADVENTURES INTO DIGITAL COMICS NOW AVAILABLE ON DVD! The Award-nominated documentary film Adventures Into Digital Comics, written and directed by Sebastien Dumesnil, produced by Dumesnil and Robert Nichols, is now available on DVD. The film features, among other artists, Scott McCloud, Chris Gossett, Marv Wolfman, Patrick Farley, Cat Garza Jr, Shaenon K. Garrity, James Kochalka, and showcases the work of dozens of writers and artists. Adventures Into Digital Comics tells the story of the crash of the US comic book industry and the potential rebirth of the medium as an all-digital form on the Internet. The film features many comic book and webcomic writers and artists and discusses the medium from an artistic and economical point of view.